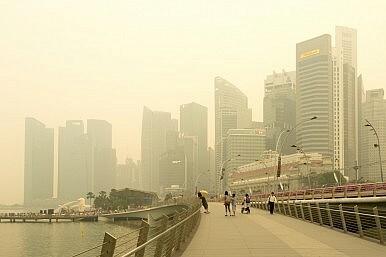 Singapore has announced that this year’s haze – the air pollution crisis caused by forest fires in Indonesia – is likely to be over. This year has been particularly bad, and future years may be worse. The continuation of the haze has led to annual calls for action from regional leaders, and media calls for Southeast Asia to deal with the crisis effectively. Yet any solution to the haze will need to be local, given the ability of local elites to effectively block regional and national solutions. Regional leaders, most recently Malaysian Prime Minister Najib Razak and Singaporean Foreign Minister K. Shanmugam, have issued strong calls for action and criticized Indonesia’s handling of the crisis. Despite the strong anger of regional leaders, as well as mounting pressure from their populations, there have been no successful regional solutions to the haze. While ASEAN has shown a degree of willingness and proactivity in regards to dealing with the haze, adopting a (non-binding) treaty, there is skepticism as to whether the bloc has the capability to provide a regional solution. Often this skepticism results from observers pointing to ASEAN’s diplomatic practices, which emphasize non-interference in members’ domestic affairs. Indeed, it is difficult to see how a regional solution can be enacted as states cannot impose any regulation or binding agreement on each other. While national calls for action and attempts to prevent the haze through national legislation are in place, they will not work given the presence of local elites who have both the motivation and the capability to derail initiatives. When laws are broken, local elites are able to curtail enforcement, as they do not enforce all central legislation (especially when paid to look the other way). This limits the effectiveness of national and regional responses. Often these local elites, or bupati, have relationships with the large palm oil companies that are responsible for the fires, leading to corruption, collusion, and patronage networks in their provinces. The desire to maintain these relationships stems from the desire for finance, partially related to the problematic structure of campaign financing. Strict caps on political donations and a lack of campaign subsidies mean that local officials require other sources of funding in order to campaign for re-election and maintain their positions of power. These campaigns are often extremely expensive, meaning that costs are high. Financial support from the parties often doesn’t reach local candidates, as caps on political donations limit the amount of finance available to the parties as a whole and what funds are available mostly go to the central party. That in turn means that campaign costs can be a problem without other sources of funding. Other elites are presumably maintaining the relationships for personal financial reasons, as they can be extremely lucrative. Local elites have also benefited from the devolution of power and decentralization enacted by Jakarta in 1999. The process itself was confused and led to a great deal of overlapping legislation in the forestry sector. While forestry policy is being consolidated, lingering confusion over which level of legislation supersedes which enables local elites to justify the permission they give for burning in their districts. This legislation has also resulted in them offering permits to palm oil companies, in violation of the law, which lends an image of legitimacy to their subversion of central power and policy. Prosecutions are limited in part due to the decentralized structure of the state, but also because these patronage networks ensure a strong presence locally of interested elites that can include the security forces. To deal with the haze, therefore, the focus must be on either the motivation or the capability of these local elites. This must take precedence over regional solutions. Removing motivation is perhaps the easier of the two options, though even here the obstacles would be many. By reforming the political funding legislation, local elites may become less dependent on finance from the palm oil companies. There is no guarantee, however, that this would mean local elites would move away from palm oil funding for other purposes. Still, compared to removing the power of the elites, an extremely difficult process, changing the funding equation is probably the best choice. Enforcing central power in the districts would require structural reform in Indonesia that re-centralized much of the powers that have been devolved. Not only would that require a legislative overhaul to clarify environmental and forestry policy, it would also mean demonstrating to the bupati that central power could now act when legislation was overridden locally, particularly through law enforcement, also a difficult task due to pervasive corruption in the police. Policies pursued by Jakarta often stall. Any solution to the haze will need to start with the local causes, before regional or even national initiatives. Without changes to local politics, ASEAN will be powerless to act, and not only because of its policy of non-interference.